A couple of blogs ago, I wrote about crazy quilt stitches. 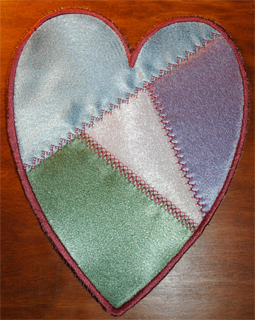 Now, we'll put them to use making a basic, stand-alone applique heart. The same technique can be used with any applique design. I used the Large Heart Applique from Dakota Collectibles. Another option is the Heart frame from gunold. Open the design in Catalog Xpress. It shows three stitches: outline, tack down, and the final satin stitch. I resized it a bit to fit in my hoop. 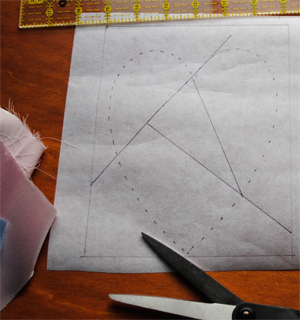 Print out a template for your applique shape. Mark hash lines on vertical and horizontal centers. That will help with hooping the piece after it is stitched. I used a piece of heavy-weight cutaway stabilizer for the foundation or base fabric. (A piece of light-colored fabric or muslin would also work.) 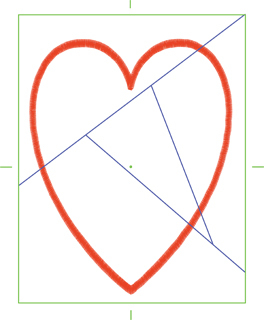 Place the applique heart template under the base fabric and trace the heart outline (red in diagram) and hash lines (green). 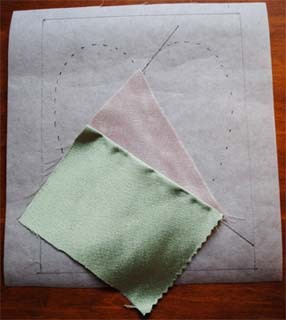 Then draw crazy patch lines (blue) where desired., extending lines well past the outline of the applique you are using. I used crepe-backed satin fabrics for the crazy patches, contrasting thread for crazy quilting stitches, and matching thread in the bobbin. Cut the pink middle triangle shape to fit that of the base fabric. Apply lapel stick to the back of the pink center triangle fabric and finger press it to the base fabric to help keep it from moving around. Press a quarter inch seam allowance along one side using the warmest iron temperature for the fabric you are using. Apply lapel stick to the inside of the fold (wrong side of the fabric) and finger press it flat. 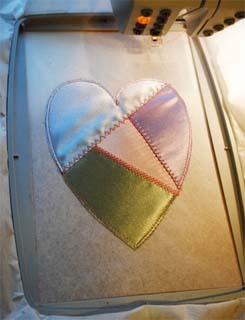 Make sure the fabric will extend past the outer edges of the heart so that the applique won't have any gaps. Slightly overlap the folded edge over one edge of the pink triangle and stitch along the fold with a crazy quilt stitch. You may find it is easier to apply lapel stick to the bottom side of the folded edge to help secure it to the base fabric before stitching. Do the same with each of the other two fabric colors. 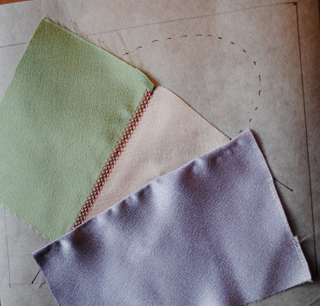 Try to keep fabrics stitched and trimmed to the lines marked on the base fabric so there is no uneven bulk showing under subsequent fabric layers after stitching. 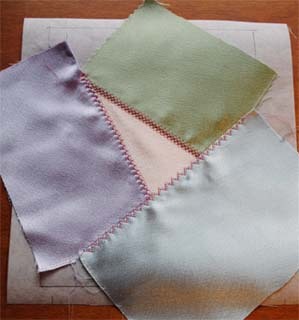 Use a different crazy quilt stitch for each seam. Hoop a heavy-weight, tear-away stabilizer. Spray the back of the crazy patch piece with temporary adhesive using hash marks to center it in the hoop and finger press in place. Stitch the outline and tack down stitches. Typically, the outline stitch is used so that you know how large an area to cover with the applique fabric. Since we extended the crazy patch pieces past the heart outline, that shouldn't be a problem. They outline stitch on top of the applique helps to hold the layers in place before trimming. When the outline and tack down stitches are complete, remove the hoop from the machine but keep the stabilizer hooped. 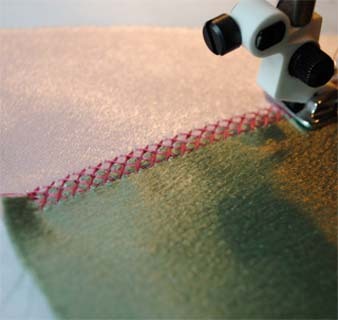 Closely, but carefully, trim around the outer tack-down stitch with applique scissors. Place the hoop back on the machine and stitch the final sequence, satin stitches, around the perimeter. When done, remove from the hoop, and attach a cord or ribbon to hang. You can also applique crazy patches directly to a quilt, shirt, or tote but be sure to use fabrics that are similar in their washability. Use as a gift tag by writing on the back with a permanent, fine-point marker. Glue to a plain brown paper gift bag. Use baby colors and create a mobile or drape as a swag with cording or ribbon. Colors can be adapted to heirloom, holiday, or seasonal. The designs can be as intricate or simple as you like and it's a great way to use up scraps! In a future blog, we'll show some additional embellishments for crazy quilting. The project was for stand-alone applique, but you could do the same on a quilt block in the hoop by appliquing the heart to a fabric block. After the crazy patches are stitched, hoop your block fabric with the tear-away stabilizer underneath and applique as usual. You will trim the crazy patch to the outline stitches and satin stitch to the quilt block. You will need to cut your quilt block slightly larger than needed so that you have plenty of room to center and trim it to size before sewing together for the quilt.